This 32 oz. labeled bottle for Noble Chemical Lemon Lance disinfectant and detergent cleaner is ideal for your business. Use this 32 oz. 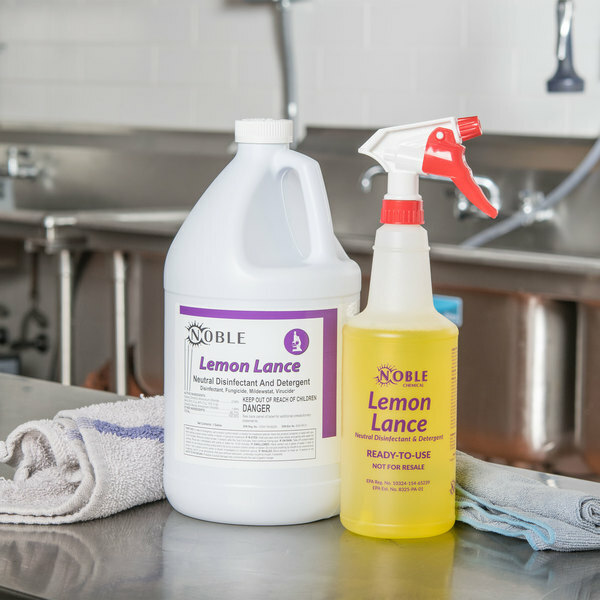 bottle to store and dispense Noble Chemical Lemon Lance disinfectant and detergent cleaner (sold separately), so you can keep floors, walls, prep tables, and countertops clean and sanitary. Rather than buying individual bottles of the Noble Chemical Lemon Lance product, you can purchase it in bulk and pour it into this bottle. By having this product on hand, you can refill it as often as you need to, so you’re not constantly throwing out bottles every few weeks or months. Plus, thanks to its 32 oz. capacity, this bottle is ideal for your medium- to heavy-duty cleaning needs and won’t have to be refilled as often as a smaller bottle. Also, by using this bottle, you’ll remain in compliance with OSHA chemical labeling regulations, since this container is clearly marked. "It's really nice to have all your chemicals labeled well, and these bottles take care of that job. 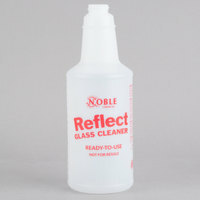 Noble makes good cleaners, so having the corresponding bottle makes my life easier." This 32 oz. bottle is already labeled to store Noble Chemical Lemon Lance disinfectant and detergent cleaner. By having a pre-labeled bottle, you'll remain in compliance with OSHA labeling regulations. Also, your employees will always know what the bottle’s contents are, preventing any confusion during the cleanup process. Instructions for the Noble Chemical Lemon Lance cleaner are printed directly on this bottle to ensure it’s always used properly. The bottle’s instructions include directions for use, storage and disposal requirements, precautions, and first aid directions. 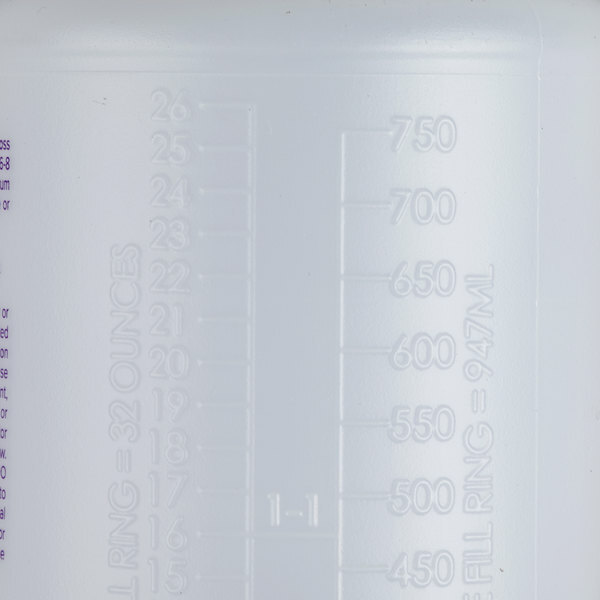 Graduation lines are molded onto this bottle, so employees can easily measure how much cleaner they want to add to the container. Plus, it’s translucent to enable content visibility. 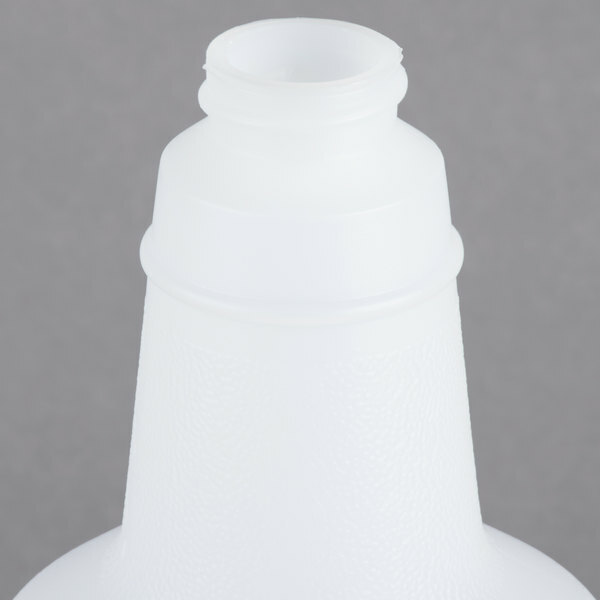 The bottle neck shape allows users to easily pour cleaner into the leak-resistant bottle, and its top is compatible with a spray nozzle (sold separately) for easy dispensing. This is a great cleaning bottle. We bought the sprayer to go with it. We have one at every area in our production room. The bottle is good quality. Noble Chemical items never fail to impress. 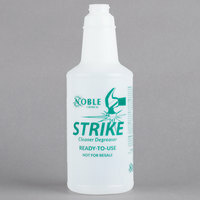 This spray bottle is a standard size and fits 32 oz spray triggers. Its sturdy walls and labeled measurements make it a good buy. The bottle is perfect size for a small kitchen. Good quality bottle and works well standard bottle spray heads. This order however, did not come with a spray head though. What can you say? Its a great spray bottle pre-labeled so everyone knows whats inside. I purchased a bunch of these to use in my high school culinary classroom that way my students will know exactly what they are using. There are so many chemical bottles to deal with in any kitchen and bathroom settings. That’s why we recommend 32 oz. Labeled Bottle for Noble Chemical. Bottles. Each comes color coded and labeled for easy distinction. Noble is a leading brand in the food industry! This product reflects the concept of "no cross contamination" of chemicals and food handling! Utilizing these bottles will provide easy distinction of the content solvent. And these are good quality bottles that will last! We recommend and rate it 4 stars! 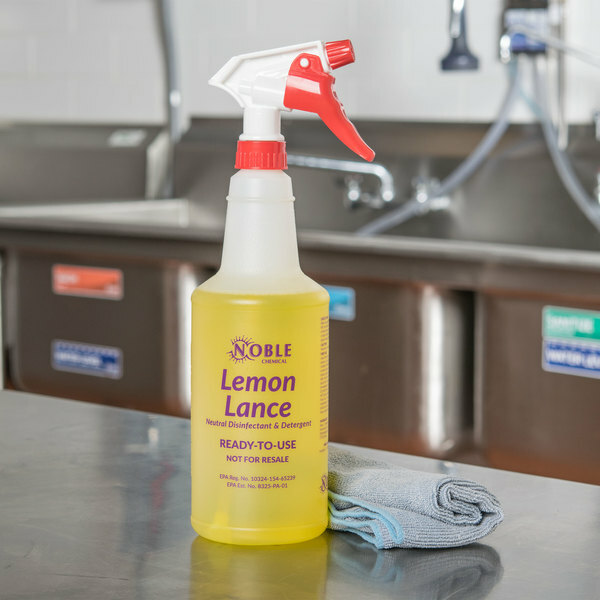 This bottle comes at a great price from WebstaurantStore and is conveniently labelled with proper identification and first aid procedures corresponding to the Lemon Lance Disinfectant from Noble Chemical. It also has graduations for proper dilution if needed. The 32 oz. 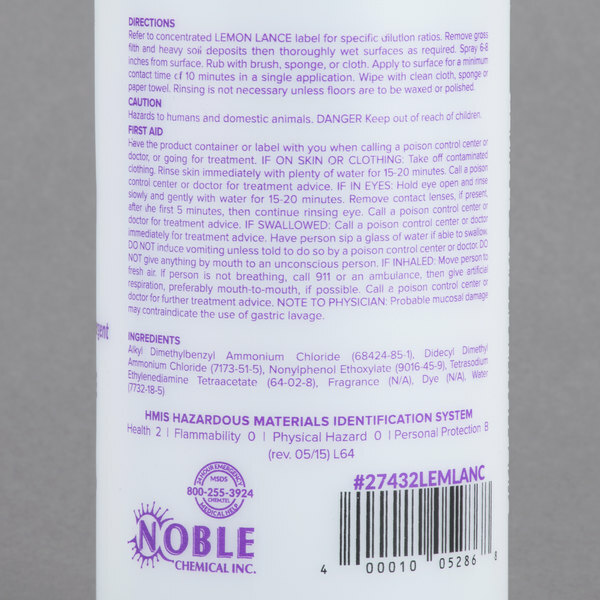 Labeled Bottle for Noble Chemical Lemon Lance Disinfectant & Detergent Cleaner (IMP 5032WG) is perfect for us, we needed a secondary bottle for backup chemical containers. 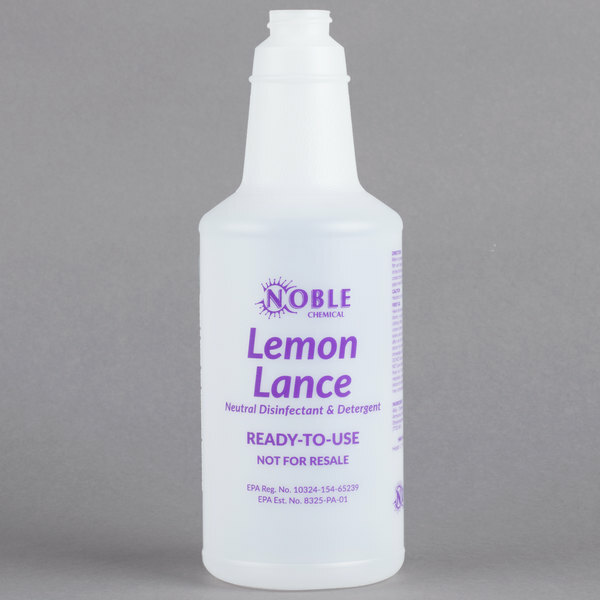 The 32oz bottle for Noble lemon lance disinfectant is a good size. Not to large and heavy . It has the list of ingredients for the cleaner on the back and is clearly labeled on the front making it OSHA ready. I bought these to easily identify what liquid is in the bottles. I LOVE these bottles, they are nice and thick and sturdy. This is for the bottle only, the sprayer is separate! 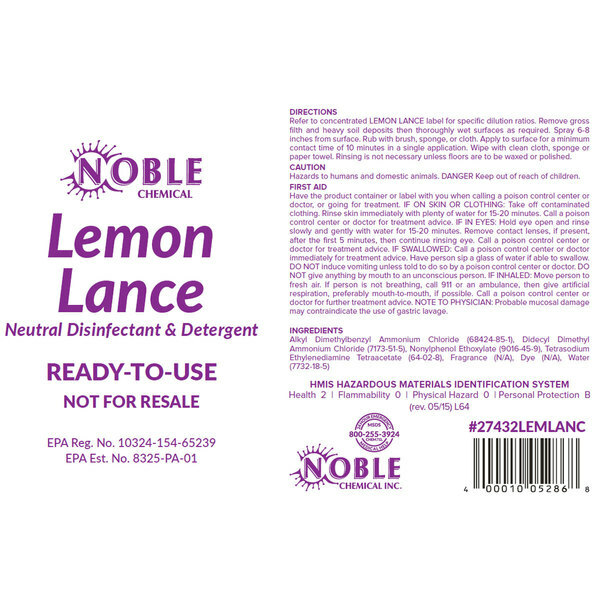 This was my first time ordering the thirty-two ounce labeled bottle for Noble Chemical Lemon Lance Disinfectant and Detergent Cleaner and I have been very satisfied with this purchase. I was very impressed to see the pre-labeled bottles to avoid confusion as to which liquid is in which container. I would like to see additional sizes of this bottle offered in the future. 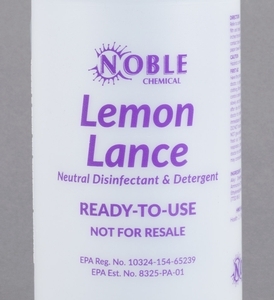 32 oz labeled bottle for noble chemical lemon lance disinfectant and detergent cleaner. These are great for quickly grabbing the right cleaning bottle for the job. Nice sturdy container with clear labeling for the cleaner! It also works well if you want to relabel it for other uses like a spray bottle for plants or to use to spray vinegar on leaves to rid them of bugs and aphids. It works well and doesn't break easily when dropped- found that one out! The Noble 32 oz. Labeled Bottle is a very nice product. The quality is pretty good and so is the price! I would definitely recommend this product. Nice strong plastic bottles. These are nice to have on hand as an extra bottle so you are always ready to go. This ones purpose is for Disinfectant. 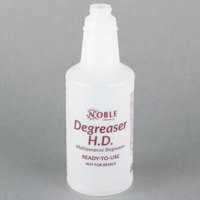 This 32 ounce plastic bottle is great for putting in laundry detergents such as a bleach based stain remover. I like it because it is labeled directly on the bottle. This 32 oz. Labeled Bottle for Noble Chemical Lemon Lance Disinfectant & Detergent Cleaner is the best solution for use this product. yoo can also write on this and see easely the content. It's really nice to have all your chemicals labeled well, and these bottles take care of that job. 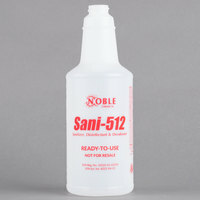 Noble makes good cleaners, so having the corresponding bottle makes my life easier. This bottle is a good sturdy plastic bottle. 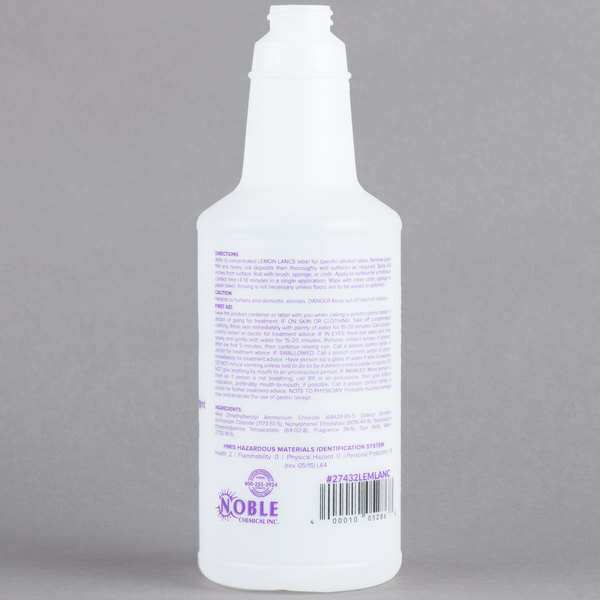 Great for labeling your disinfectants and detergents, this bottle will help you with all of your cleaning needs!